Pink, Pink, Pink! Throughout October, You may find Pink Ribbons all over (yogurt boxes, t-shirts, hats, bagels..) to represent Breast Cancer Awareness Month. Let’s help you learn a little bit of information behind this widespread form of cancer. Ductal carcinoma – starts in the tubes or ducts. Lobular carcinoma – starts in the parts of the breasts, called lobules, that produce milk. Breast Cancer can be invasive or noninvasive. Invasive – it has spread from the milk duct to other tissues in the breast. Noninvasive – it has not yet invaded other breast tissue. 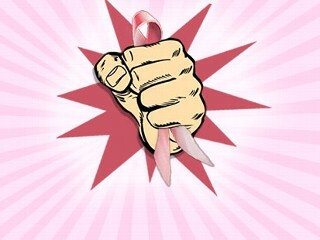 Women are 100 times more likely to get breast cancer than men. Your risk of developing breast cancer increases, as you get older. If there is a family history of breast cancer you are at higher risk. Some defective genes can be passed down. The most common gene defects are found in BRCA1 and BRCA2 genes. Women who get their periods early (before age 12) or went through menopause late (after age 55) are at an increased risk. Women who have never had children or who had them after the age of 30 have an increased risk. More than 1-2 glasses of alcohol a day may increase your risk for breast cancer. Healthy living can decrease your risk for Breast cancer and other diseases. Did you know men get breast cancer, too? Screening all women is critical in spotting breast cancer. Up to 50% of women diagnosed with breast cancer have no identifiable risk factors except female gender and increasing age. It is important to know the Signs and Symptoms of Breast Cancer. The outlook for breast cancer patients depends on the size, location, and behavior of the tumor, as well as the patient’s health. Because breast cancer diagnoses are so common, it is one of the most deadly cancers affecting women around the world. Approximately 88% of women diagnosed with breast cancer will live for ten years after the diagnosis. Support the Pink Ribbon throughout October! Tell us what you plan to do in order to keep the awareness going!